In this second article on the history of the St. Alphonsus’ church, I am heavily indebted to and grateful for the work of Mr. Kenneth A. Richards. His publication “AMIDST THE SUGAR CANES” published in 1991 is a wonderful source of history. 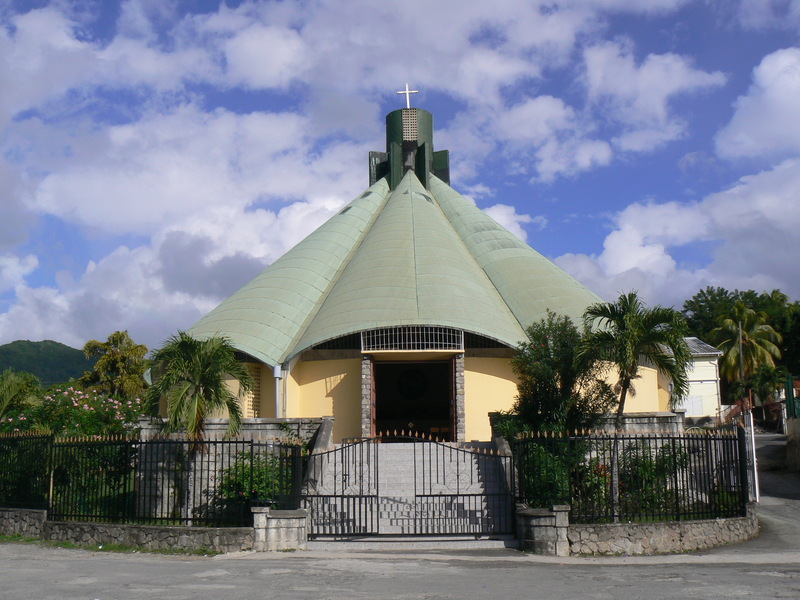 On August 29, 1979 Hurricane David caused severe damage to the first St. Alphonsus’ church, which was started in December 1929 and dedicated and blessed by Bishop James Moris on October 5, 1930. The roof was torn off, windows blown out . Many arches, columns and walls were severely cracked and damaged beyond repair. The congregation moved to the downstairs of the St. Alphonsus Parish Hall for worship. The damaged old church was demolished in 1985 and it took till May 20, 1987 before the groundbreaking ceremony for the new church was performed by Fr. Francis Huysmans, Vicar General. 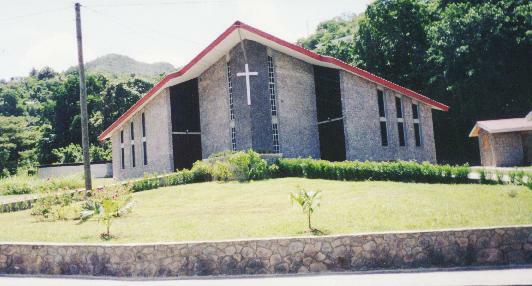 The new church was designed by a Trinidadian architect Geoffrey Maclean and the engineers were the local firm Consulting Engineering Partnership. A scale model was prepared and put on display. An intensive fundraising drive was started. The local firm L. Luke and Sons Construction was contracted to construct the church in phases. Shortly after the commencement of the works, Fr. Eustace Thomas left to continue his studies and Fr. Paul Loncke C.Ss. R. was appointed parish priest. The task of building a new church fell then on his shoulders. In this task he was ably assisted by the Reconstruction Committee comprising of Mr. Sheridon Jno Baptiste, Dr. Desmond McIntyre, Mr. Jerome Robinson, Mrs. Adwina Magloire and Ms Molly Fontaine., Mrs. Zena Boyd and Mrs. Rona Fingal. 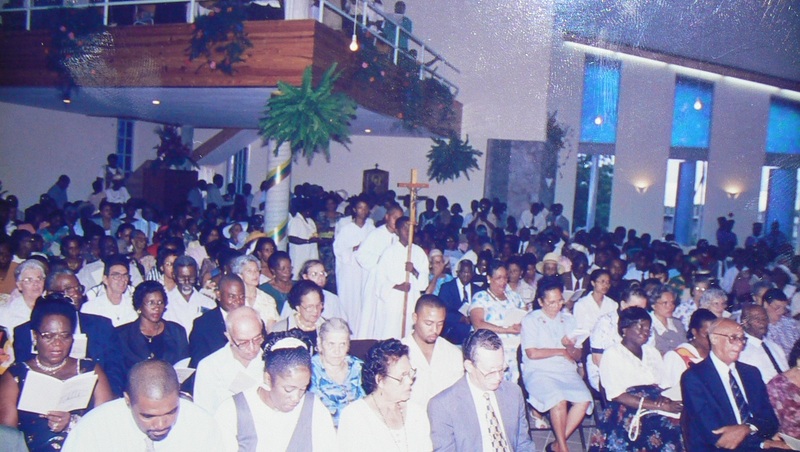 During the years that Fr Charles Martin was parish priest vegetable soil from the Holy Redeemer Retreat Center in Eggleston was sourced and the area around the church was landscaped, fenced and planted under the supervision of the Landscaping Committee, comprising of Mr. Jerome Robinson, Mr. Milton green, Mrs Adwina Magloire, Mrs. Zena Boyd and Mrs. Rona Fingal. 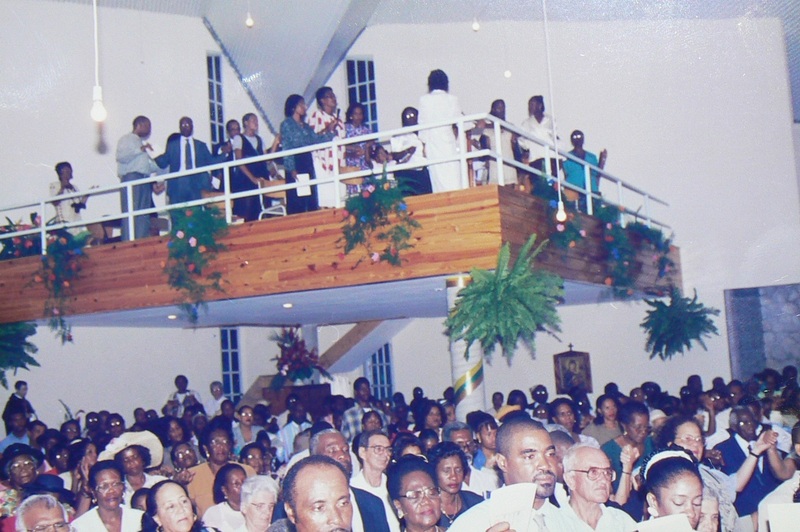 During that time, the interior church was also painted by the late calypsonian Roland James “Spider” under the direction of Mrs. A. Magloire. Due to the height of the church, this was quite a dangerous and complicated job. 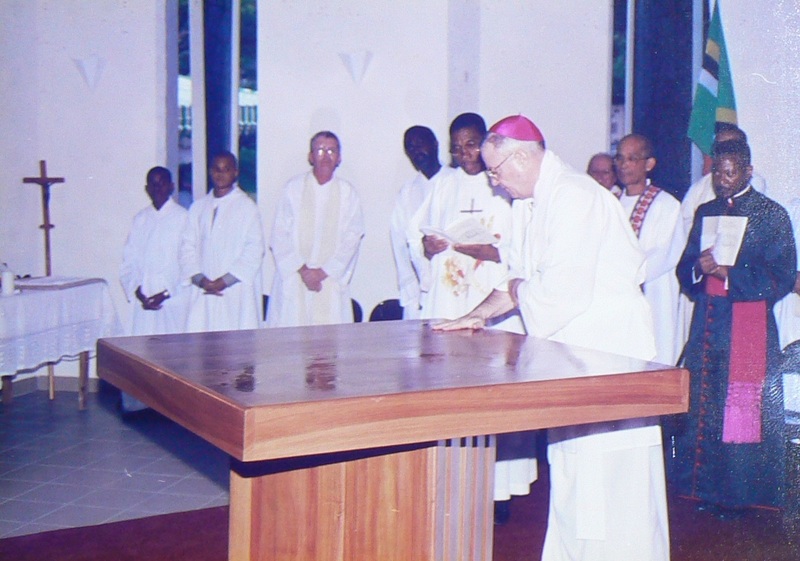 All the prayers, patience , work and fund raising finally paid off when on the second of August 1999 the new church was solemnly Blessed and Dedicated to St. Alphonsus by Bishop Edward Gilbert, eighth Bishop of Roseau . Fr. Reginald La Fleur was the Parish priest at the time. When Father, later to be Monsignor, Reginald LaFleur became Parish Priest , he proceeded with the building of beautiful stone walls and metal fencing around the church. In all the work he did, he was ably assisted by the Fundraising Committee : members : Mrs. Jossie Stevenson, , Mr. Milton Green, Ms. Debra Grell, Ms. Stella Giddens, Mrs. Veronica Younis, Ms. Sherita Gregoire, Mrs. Carol Abraham, Ms. Cloudette Casimir, Mrs. Joycie Alfred, Mrs. Evelyn Guye and Ms. Molly Fontaine. 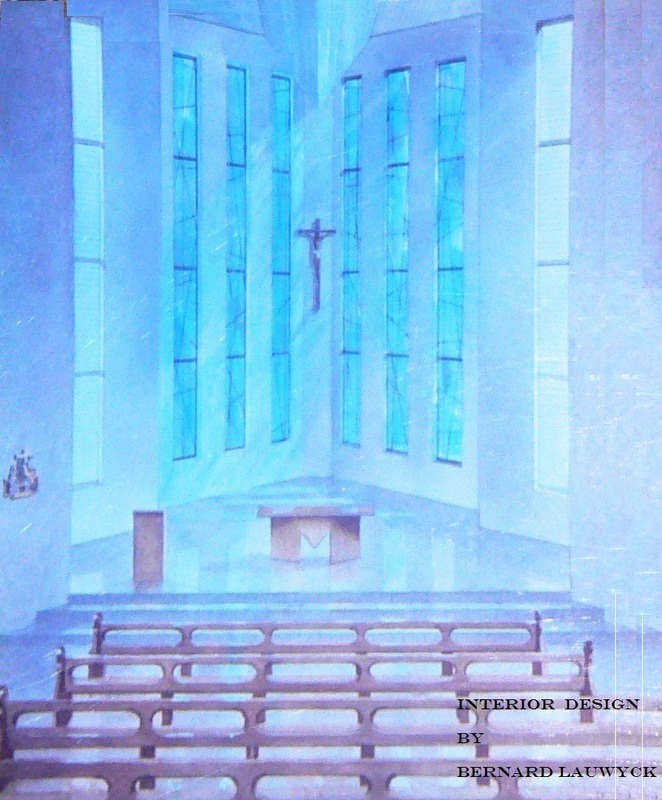 When Monsignor Eustace Thomas returned to the parish, as Parish Priest, in 2008, he was keen to enhance the liturgical space and the surroundings of the church. In August 2010 a new stained glass window was installed with the crucified Christ as theme. Sometime later , two new stained glass windows, with the Eucharist and the Blessed Virgin as themes, were added. Recently the steps and the patio in from of the church were tiled and an entrance gate installed. Painting works of the church are ongoing presently. 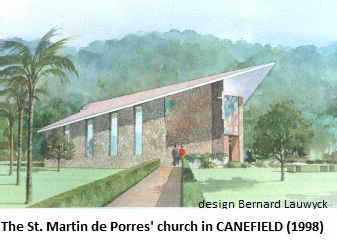 The next step will be the upgrading and development of the church grounds in front of the church . This will enhance the whole church environment. This entry was posted in modern church in Dominica, NEW CHAPELS or CHURCHES, St. Alphonsus' church in Pottersville and tagged Goodwill church, Pottersville church, St. Alphonsus church in Goodwill on April 2, 2015 by Bernard Lauwyck.